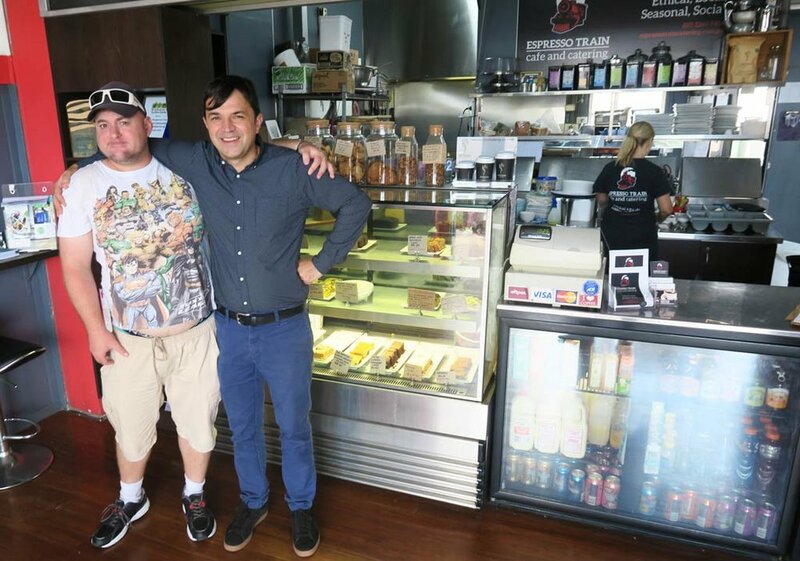 Richard Warner is the Coordinator of Nundah Community Enterprises Cooperative (NCEC), a social enterprise creating meaningful work opportunities for people with a cognitive disability. NCEC was awarded the Best Social Enterprise in Australia in 2015 and in 2016 was finalist in the same awards for its work supporting refugee communities to establish their own enterprises. Richard has a background in Social Work and Community Development and volunteers on a number of not-for-profit boards. Richard is the current Secretary of the Queensland Social Enterprise Council (QSEC) Australia's first peak body for Social Enterprise. Richard has a long history as an advocate, volunteer and paid worker in the disability and community sector and resides in Brisbane, Queensland. Michael Cherry is an active Board Member of NCEC and has been with the cooperative since its beginnings. Michael has worked across the various businesses, including parks and property maintenance and the cafe and has seen NCEC grow to a team of 20 employees. Richard and Michael discuss their experience and insights in working at one of Australia's first modern social enterprises. Michael shares how positive the experience has been for him as someone with a disability and Richard talks about social procurement and the growing social enterprise sector. [Tom Allen] - Could you both please share a bit about your backgrounds and what led you to working in the social enterprise and co-operative sector? [Michael Cherry] - Well I was looking for some work. I was working pushing trollies and stuff, and basically none of that worked out for me, so I basically went to my work and told them I needed to find a job. Someone said, look there's a possibility in the co-op that there might be some work. Dave was the coordinator back then, so I started out with the parks group. So going out in parks, mowing parks and doing jobs like cleaning units and all sorts of stuff. I really enjoyed the job because people out there don't realise that for those of us with a disability, we're capable of doing just as much work as anybody else and putting in the effort. And I think for me, I put in the effort 100% of the time. Every time I'm in there I make sure that things are done right and that I do a good job. The people would come up to me and say "Gee, you do such a good job, you're a nice person." I'd say, "Look, I enjoy working here, the bosses are great people." It's really hard to find jobs out in the community for people with a disability. We started this co-op basically so that people could find work and have some work in the community. People were finding it hard to find work out in the world and so they all got together and said, "let's start a co-op," and so we did, and then we started off from there. Fantastic. Richard, can you tell us about the beginnings of NCEC and your involvement since working here? [Richard Warner] - Well, my involvement was from hearing about the great work that people like Michael did, and Dave Langdon, who we've mentioned; the group of people who set up the co-op. And I was really impressed with that model because it was an example of you know... commonly in the disability world you see organisations set up to serve people, or do things for people. And that's great, that's important, but this was an example of an organisation where people developed it to help each other, to help themselves. And also they were running a business and they could decide what to do with the profits of that business, which they put into more support for the workers, so it was a really impressive model; one of the first hybrid social enterprises. A sort of hybrid charity and business. And I was really attracted to that so when the job came up I put my hand up. Could you tell us more about the sort of projects that you are involved with at the co-op, and what the broader aims of the organisation are? [Michael] - Well our aim is to keep people who are in the job, to stay in the job and maybe one day they might move, or they like to stay there, just to keep their work. Because for me, if I didn't have this work, I'd be sitting at home, watching TV, looking at four walls, so basically, it gets me out of the house, talking to people in the community and basically just having people that can help you through things. Because I had a mental illness a couple years ago. I was in and out of hospital, so it made it very hard for me to concentrate on the job I was doing, at that time. I used to work in the parks but now I'm working in the café. And the people in the café are really awesome people. We have staff in the café that've come and gone and you know, it's been a good couple of years in the café. You get to know the people, and what sort of job they do and you get to meet the different chefs in the job and how they do the job and different ways of cooking their food. Now we've got this chef called Steve, whose been in different cafes and restaurants in his career, and he came aboard a couple of years ago. With him and Kirsty, and it's been really good. The food's been delicious. 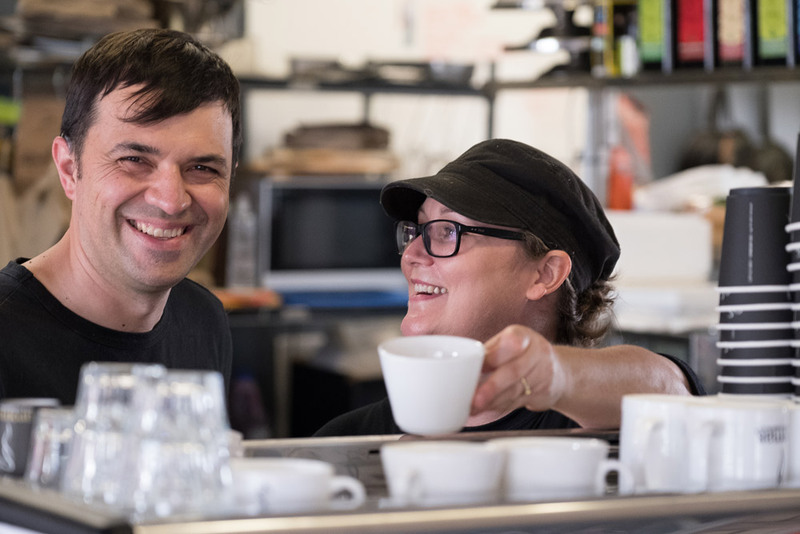 He's a very nice bloke, and people like to come to work every day just for a cup of coffee, or just to say G'day, and get that opportunity for the public to see us out there working and know we're achieving the goals of getting the money to help other co-ops too. If we can start helping other people start other co-ops, that's positive stuff for me, and everybody else. Because its pretty hard to start a co-op, but that gives them the insight of what it's done for us, and just the courses we're doing as well. People are doing their own businesses back in their own cafes after the jobs (they've done here) and it's been a very positive thing in this co-op. We're making money, like as I said sometimes when our chips are down we just pick ourselves up and we keep on going. We try to keep the business going by getting more catering out there. It's been positive because people are saying that the food's been really good, and they're really enjoying the food, and they would love to keep the catering going for the business. And that's good for us 'cause that keeps the money going for us and keeps us employed and keeps us going. Every day I come in to work and I'm always happy and I'm always willing to just find work, whatever there is, and it's been great. So for those of us listening, who are unfamiliar with co-operatives, could you please explain how co-operatives differ from other enterprise structures? A co-op is quite a different beast. The primary difference is it's a member based organisation; a member based structure. So the authority resides in the members and the co-op is all about serving the needs of the members. So, that's probably the primary difference. In terms of this co-op, it was a group of people who were long term unemployed, who had tried everything they could to find work and were unable to find work, so the initial eight members of the co-op came together and said, "let's try and generate work for ourselves." And that was the formation of the cooperative. [Michael] - Now we've got 20 people working for us, and they're all doing their different jobs. People out doing the parks, people in the café, so its all positive stuff. And they all enjoy coming in every day to do the work, so people are so happy to see them. Could you please tell us a little bit about some of the biggest challenges that you guys have faced as a co-operative, and how did you navigate your way around them? There's a twin set of challenges, so one is, are we creating a work space that is adapted to the needs of our members with disabilities, and is supportive? So that's a challenge. And then the other challenge is are we running viable, productive, efficient businesses? It's the creative tension of what we call participation and production so we're balancing that all the time. And if we do that right then we move forward with the business. [Michael] - Exactly. If we can keep the people in the job and the money rolling for them, so they've got savings, you put money away each week, my goal is to get my licence next year. So, buying a car and all that, so the money I'm getting from here, gets me that one step closer of getting my dream thing to do and I'm saving a lot of money. I'm putting a hundred bucks away each fortnight from work. I've got so much confidence from the work. Even when I was sick, you know, people were always supportive. I've had people when I was in hospital come up and visit me and see if I'm alright. You know, you don't get that in any other job. People just don't care out in the world. All they care about is you doing the job, and if you don't do it then you're fired. But here the staff make sure you're working and they always check on you to see if you're okay, and if you need to talk to them you can stand them aside and say, 'I need to talk to you about something,' and they're there to talk to you about anything you have. And you know, I wouldn't have that anywhere in other jobs. This job's been really positive for me, and I think it has for everybody that works here. It's all been positive stuff. That's great to hear, and it sounds like a really supportive environment. What would be the top three tips that you'd give to someone who's keen to start a co-op? [Michael] - Basically, if you want to start a co-op, number one, make sure you've got work there. And number two, you basically make sure the money's rolling, you try to start a co-op for them and if they need advice they can always come to us, and we can give them advice or maybe go to their business, and teach them how to start up a co-op, so it works out for them. Because it's been so successful here, I'm pretty sure anywhere else would be successful for them. It's just getting them started. And if we can help them get started with this business and get more co-ops going, it means they'll get more people in jobs and more people working, people with a disability who can't find work. It gives them work and gives them things to do, and that means it's a positive thing, working for a co-op. I reckon that the more people who are in working means there's less people out there on the street drinking and taking drugs, not having food on the table and paying rent. How have you seen the social enterprise in the co-operative sector transform and change over the last five years or so and where do you see it heading? [Richard] - It's certainly growing. NCEC was probably one of the first modern social enterprises in Australia. We started in 1998, so the social enterprise sector is really growing. Not so many co-operatives as a part of that mix, but that is growing as well, and there's a bit of resurgence on the part of the co-operative movement in supporting new developments. There's a big body called the Business Council of Co-ops and Mutuals, so we're looking into what they call Public Service Mutuals, they call them. Or Social Co-operatives. And trying to support those, to form around needs like unemployment or disability support or whatever it is, so that's changing. You're certainly seeing a [social enterprise] sector that's able to define itself, and its impacts better and its point of difference. Certainly. So, if we're to look at social enterprise from a policy perspective what do you believe would be the key steps the government need to take to help foster and support an innovative social sector? [Richard] - I think the most significant thing is social procurement. So, the tendering of work to social enterprises. With either some work set aside for the social enterprise sector, or there being some weighting in the tendering process in favour of social enterprises and recognising that social impact and the financial social benefit that has. Giving us work's the most critical thing for us to grow in this sector. [Michael] - Yeah. I think if the government was onboard, and they help us support the co-op, maybe that would be a good thing too. Like, our local people up the road, just to have them support us, and you know, give us a bit of money now and then, if they can afford it. And just getting that support from the community, if we get the community support, it means we can support more people in finding work and it keeps the business going. Beyond the work that you are doing, are there any really inspiring projects or initiatives that you've come across recently, which are creating some great positive social change? [Michael] - Well, we just did a talk up at Bundaberg talking about our experiences and I thought that was positive for me. The people there were pretty supportive saying that was a great talk and I think things like that gives people support to start up their own work or some kind of work for people with a disability. There's a lot of people with a disability that don't have work and are doing nothing in their lives. So I think for people to get the people who have a disability the chance to do something that they enjoy, even if it's work, it's a positive thing, because there's a lot of people who've got a disability who are trying to find work and just can't because no one wants to employ them. Because they've got a disability they think they can't do the job and they're not good enough for their business and I think that's really sad. I think more people out there need to understand that we (people with a disability) can do the job just as well as anybody else. And we're capable; you've just got to give us a chance. Give us a chance of trying to do it and we may be a bit slower than other people, but if they just give us a chance, that's a positive thing. Fantastic Michael. Richard, did you want to add to that? [Richard] - In terms of social enterprises doing good stuff? Well there's Emma-Kate and Rob over at Salisbury, so they're very impressive; Food Connect. We've watched them for many years in terms of their depth of impact and their passion and drive. [Richard] - There's great Australian examples like Food Connect and a range of social enterprises in Australia, and certainly Queensland. Some international ones we've taken a bit of an interest in, there's the Self Employed Women's Association, in India. SEWA, so they're very impressive, working with women around micro finance and business, and bringing non unionised labour together to women to support each other so they're very impressive. The other group I've come across lately, they've been going for a while now but they're call The Greystone Bakery. So they're in New York, in Yonkers, and they have a open hiring policy. So, they run a bakery, and they employ basically anyone who comes in off the street. And they've got a contract with Ben and Jerry's ice cream, to make all the brownies. They're really a very impressive social enterprise model. That one, but there's so many great examples across the world. To finish off then, what books would you recommend to our listeners. [Richard] - Well we've written a book called Participation And Production. [Michael] - I reckon if I wrote a book, I'd write a book on my experiences in the co-op and my life. How the work's helped me with my mental illness, and how it's kept me going and just write about my experiences at the co-op all these years. They'd probably be a lot of insights if I wrote a book. I could write a book on the insights of all the work I've done, and what I've seen and what I've done, and seeing staff go in and out, stuff like that. [Richard] - There's a great book on co-operatives, called Humanising The Economy, by a guy called John Restakis, so that's really like a bit of a tour of the world and lots of different co-operatives. You can contact Richard on LinkedIn or Twitter. Please feel free to leave comments below. Find other articles on social entrepreneurship.